Happy week-end you guys! I’m spending mine under the ever-changing swiss weather, you just never know when it’s going to be super sunny or super rainy. It can switch in exactly 10 minutes. AND I am also dreaming of our beautiful sunny escapades between Sardinia, Mykonos and Santorini, already excited about the next trips that are planned. Each time while leaving to a summery destination, it’s a fun challenge to pack the essentials. I guess you could go two ways, either you’re the kind of blue jeans, white shirt (popped into the room you know you made my eyes burn, sorry I just had to), SPF, flip flops, living out of fresh coconut by the beach, toes in the sand, swimming naked in the sea (one day perhaps I’ll achieve this light packing method) OR you’re more like me packing a massive summer gear with you made out of several swimming suits, sun glasses, sun screens, after sun balms, body mists, books, magazines, towels, hats and the list goes on… I am a crazy “stuff” lady. I just love stuff. The best part out of it, is that I use everything I pack. That’s my only rule while doing my luggages. Even if I take half of my place with me, I am obligated to use at least once each item out of it. Otherwise, it’s internal game over with my own conscience… It is a game over 80% of the time as I usually never use the after sun balm… As I don’t tan… But I love the bottle so much (eeeek). Sometimes I’ll get my hands on it anyways as I love the scent so much and just to say that I did use everything. Here’s an obvious. I’ll never leave for a sunny destination without grabbing some sun screen with me, you can never be careful enough. Since my skin is so fair, I’ll usually go for an SPF 35. I’ve been told not to believe in SPF50 as it is, supposedly, impossible to achieve higher protection that 35 if considering the chemicals within the product. So when you buy an SPF higher than 30, you’ll usually get the same result. I would need to research this fact a little bit more, but so far it worked perfectly for me. I’ve never turned lobster red or peeled every since I’ve been careful not exposing myself too much and using enough protection. 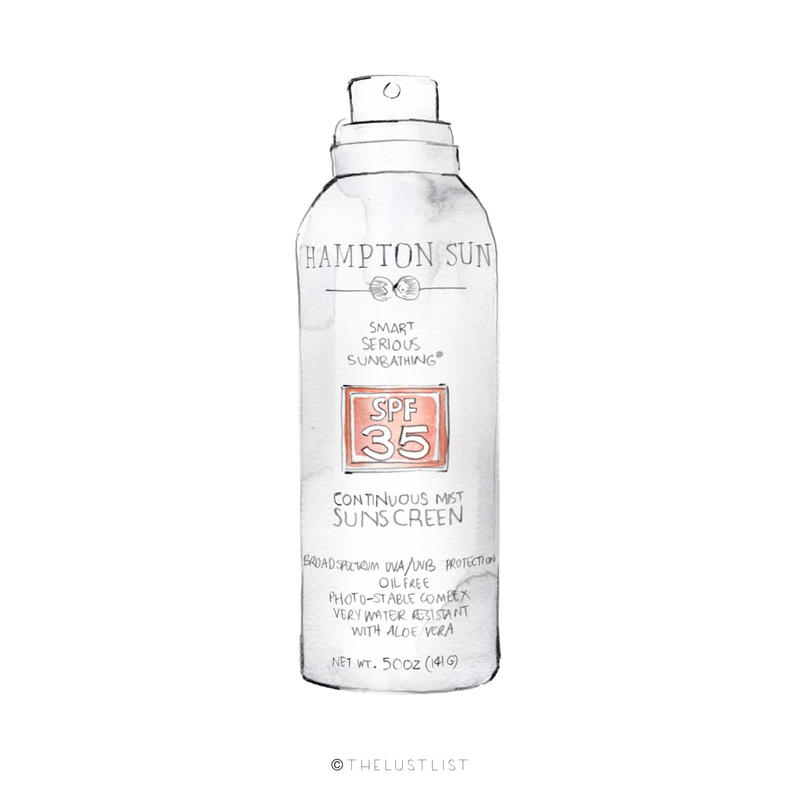 I do enjoy a spray formula, this one by Hampton Sun is great as it’s also super soothing with it’s Aloe Vera properties. If your body needs protection from the sun, your eyes do to. I actually never really liked my face with sun glasses on. Since I have a round shaped face, there are very few sunglasses that fit me perfectly and I most of the time like to avoid wearing some. However, I recently started investing in a few that I felt good with having on because I know how important it is for the eyes. Having the UVs hit directly or even indirectly your eyes isn’t good at all for your sight and is definitely a bad wrinkle prevention. 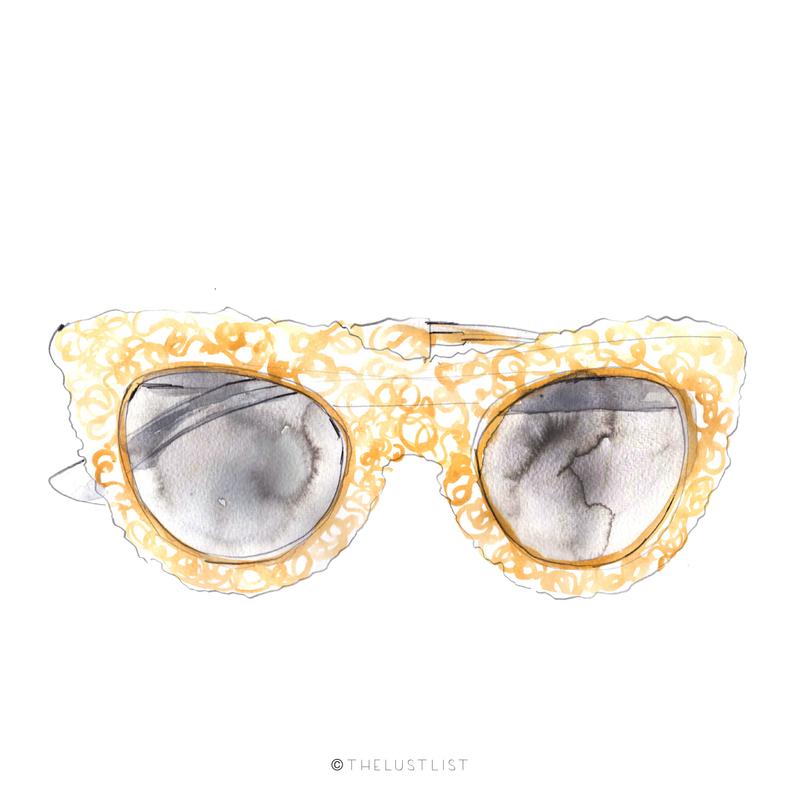 Not to mention that sunglasses are such a beautiful accessory to add to your summer outfits. I usually go to the beach with a very natural (if no) make-up on, some BB cream, brow filler and that’s usually it. My outfits are also very laid back and casual so I like to add something special, like a headband or turban. It’s a great fashion trick but also good as it holds back your hair when the sea wind blows into your face and looks great matched to colorful beach towels. 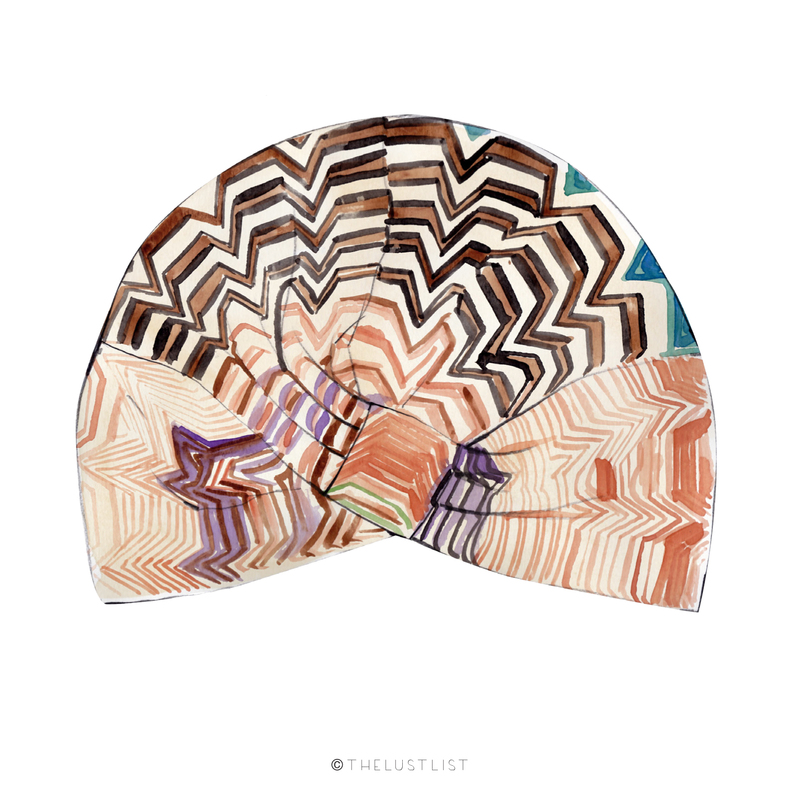 Missoni’s turbans are absolutely to die for. During winter, I like to be a little more simple and basic with my nail polish shades, while in summer I use lighter, warmer and bolder tones. Especially on the feet. 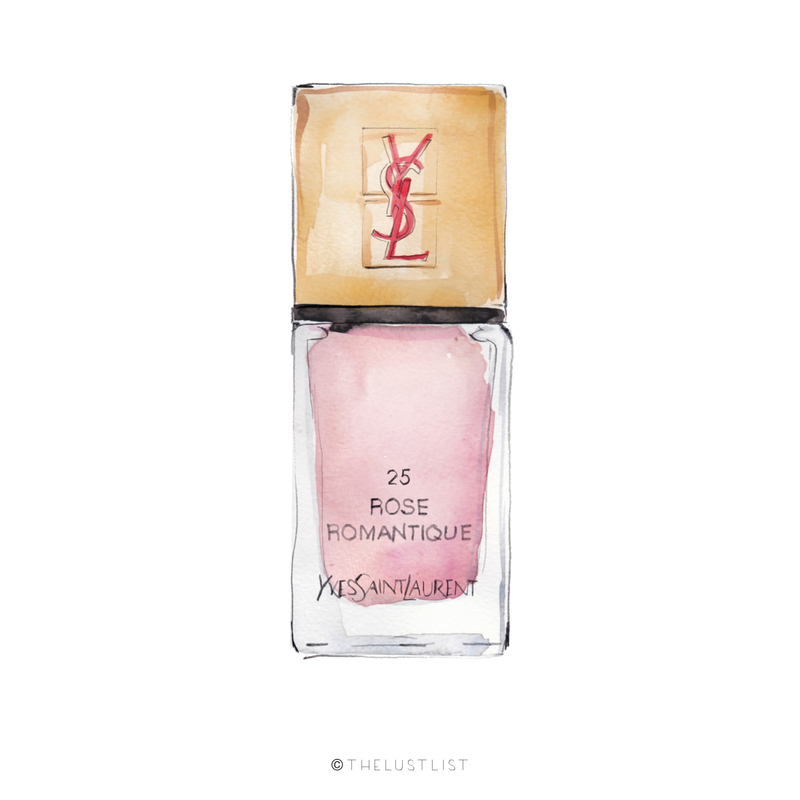 Lately I’ve been loving most of YSL’s summer colors (the quality of their nail polishes is simply amazing) as well as Dior’s. To have a look at my favorite shades you can check this week’s beauty article where I talk about them. Currently I am wearing YSL’s “Eau De Rose” on the feet and “Muguet” by Dior on the hands. I’ve been reading so many different books lately. As I usually don’t have much time to do so (I spend most of my time binging on information on the web and then rushing somewhere) summer is that ideal time when you can actually cool down, plan 5 hours ahead to do nothing but chill on the beach and read a great book without having to run somewhere. I’ve been reading ” The Fault in our Stars” by John Green, Boris Vian’s “L’écume des jours”, a book about music industry, “Girl Boss” by Sophia Amoruso and Grace Coddington’s Memoir. Finding the right swimming suit all depends on your destination and activites honestly. Wether you’re planning to tan, lounge, pool party etc. it’s nice to have a diversity of styles of swimwear. Sometimes it gets to me and I love to have long swims, for that I don’t particularly need a complicated swimming suit, I just like something comfortable and easy. Yet while tanning on a nice beach or before heading to drinks by the pool, I also enjoy having a colorful, super flattering bikini, something with an interesting, playful design. My favorite swimwear usually comes from Moeva London and Zimmermann. They have incredible pieces! This one joins in the head band motto of bringing in something special to a casual look but is also a great way to protect your head from the sun. 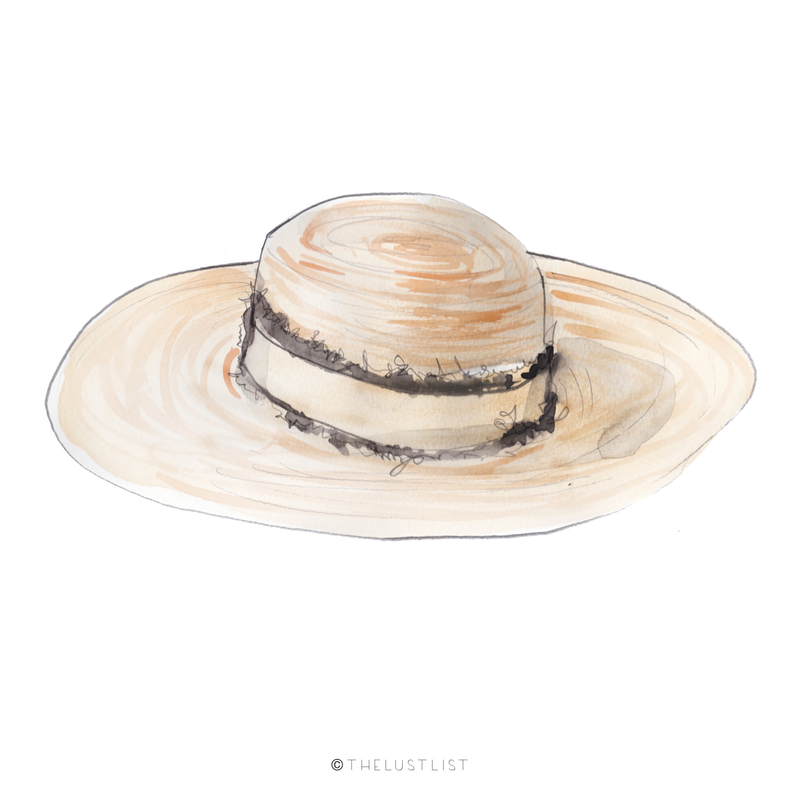 I like wearing really big straw hats as I feel like I’m in my own little shade bubble. I easily get headaches if spending too much direct time in the sun, so having a hat on is the perfect way to avoid that. Obviously, one of my favorite brands for hats is Maison Michel but also love the ones from Eugenia Kim. At first I used to have these big towels with tons of strange logos on them or drawings of tigers or all sorts of tropical animals. My parents and I would bring at least 6 of them for a day at the pool, 1 each to sit on, 1 each to dry up. Now I’m good with just one and preferably with a nice, subtle design. 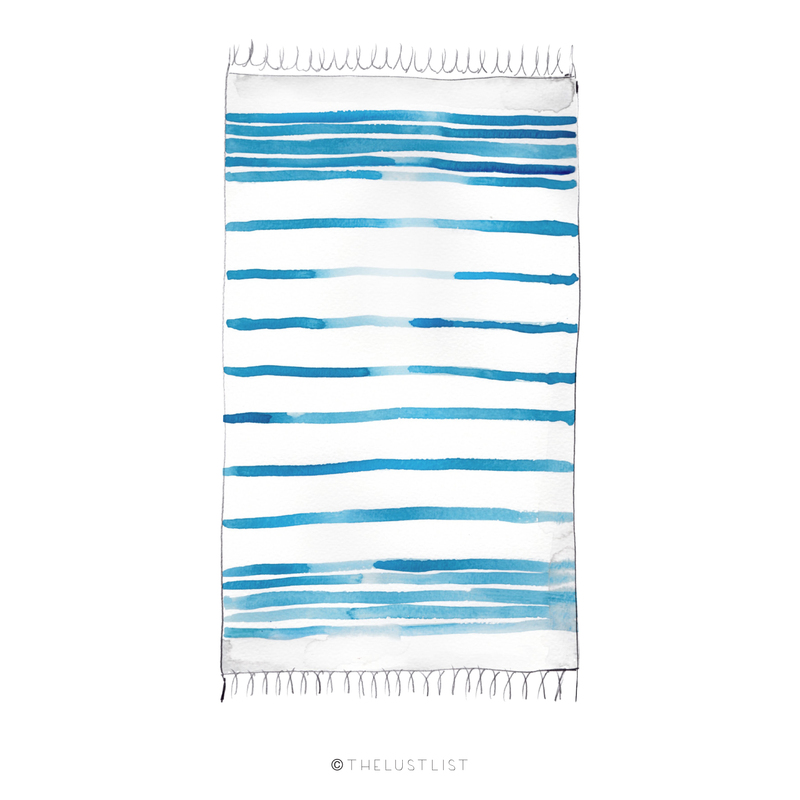 For the beach I love something with a bold flashy color, for the pool I also enjoy stripes. I’ve found some absolutely adorable ones on Net-A-Porter by this brand called Hammamas. A little refreshened is so highly appreciated while lounging under the sun. 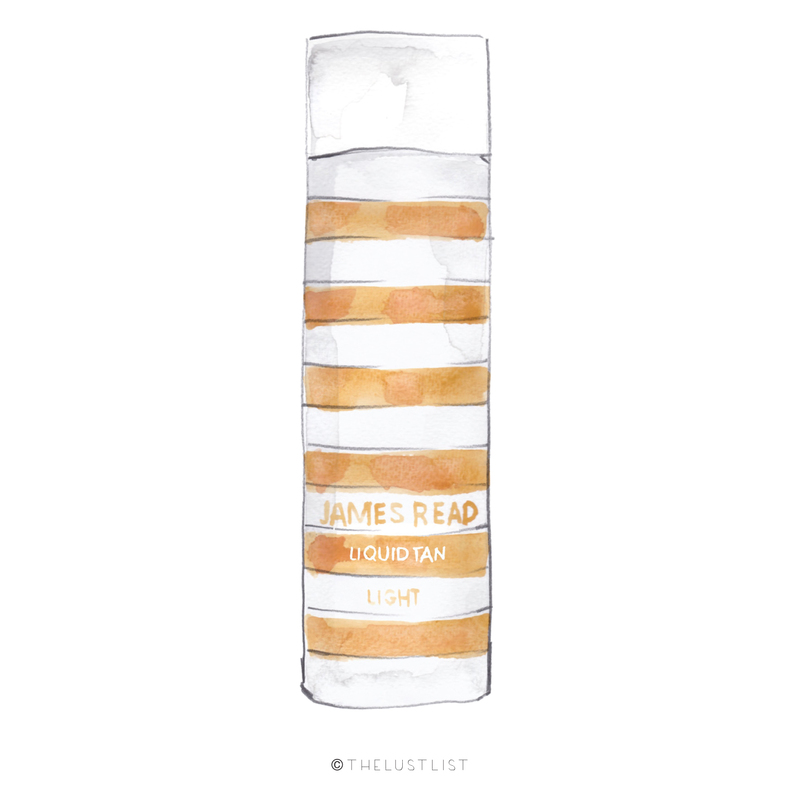 It’s the biggest pleasure and luxury to be able to spray some deliciously scented fragranced mist over the face and whole body for a little cold, sweet breeze. My favorite is Guerlain’s Eau Sous Le Vent for it’s Monoî scent and soothing agents. As I don’t like to expose myself too much in the sun, I’ll always have some bronzer with to achieve and maintain a golden skin color. I’m fair skin proud but still, I don’t want to look like a little pancake at the beach. So before heading to the out, I’ll always apply some bronzer all over face and body, let it work a couple of hours while having breakfast for example, then head out with a sun glow that leaves everybody wondering how’s it’s possible to tan in the shade. These illustrations are so beautiful, I love the watercolour effect! I love your summer picks, the nail polish is stunning. What a beautiful collection of items! I love your game of using every single item that you take on holidays at least once. I may have to try it... but I think I may fail! 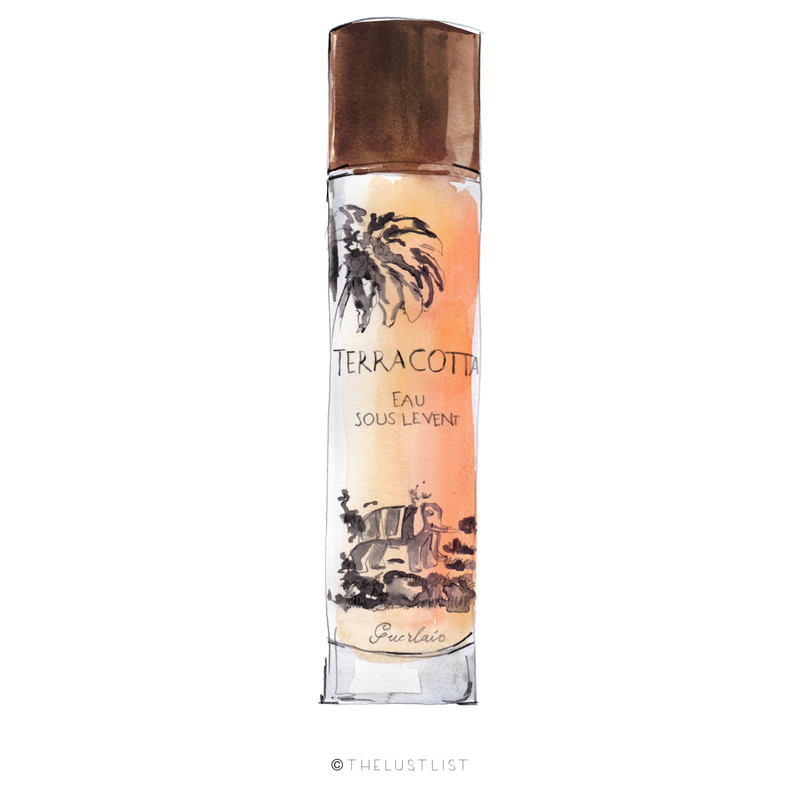 Love these illustrations and the reviews! Really interesting article with beautiful illustrations! The illustrations are so cute. This is becoming one of my favorite features of the blog. I am the first type of traveller, I always want to pack efficiently more than pack "everything from my place" with me. I love these illustrations on your blog, it makes it look even better and more inspiring! I love love love the lustlist! Ahh.. It's soo good to read a post about summer, beach and tan. In my hometown the weather is finally getting hotter. So this post is very handy. She's so talented! I love this!! 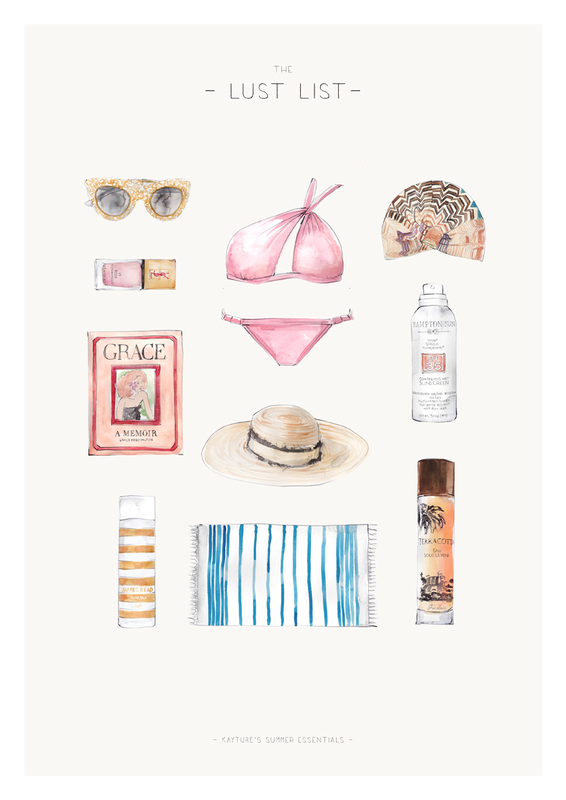 Oh totally agree with all the beach essentials! Another essential for me is definitely a gorgeous beach bag, love to take the Neverfull GM in Damier Azur with me! loving the drawings - totally different to the usual photos (which are perfect, btw! ), though fits perfectly! I really love when you post illustrations ! This one is so cool, basically the only things we need for summer ! The illustrations are really pretty! And thanks for the SPF tip, I didn't know that it's technically impossible to achieve SPF 50. I think I'll just buy SPF 35 from now onwards! Loved this selection ! And the cute little drawings are so nice ! Loved that , really ! :) Nice post ! I loooove this post! Those drawings are sooo amazing!!! Amazing! How you created such a graphic? This post makes us wish we were going on a beach holiday! I really love these illustrations!!! Great post, love your illustrations! Although my upcoming holidays aren't to anywhere tropical (in fact, I'm heading to Argentina where it's WINTER then to Toronto right after), I'm inspired to start packing and to pick out items that make me happy and comfortable no matter where my journey takes me. It's been so hot here in New York that I'm actually excited to wear cozy sweaters and ... pants! What cute they are! Thanks so much ! Love love love the art! Such a creative way to display your summer essentials! Oh my gosh, I've had the Grace book for a while now and haven't read it - you've inspired me to get it off the bookshelf and start reading! I love the Lust List artciles!! The illustrations are so good! IN LOVE with these illustrations. It would be amazing to see some fashion illustrations of your looks also! 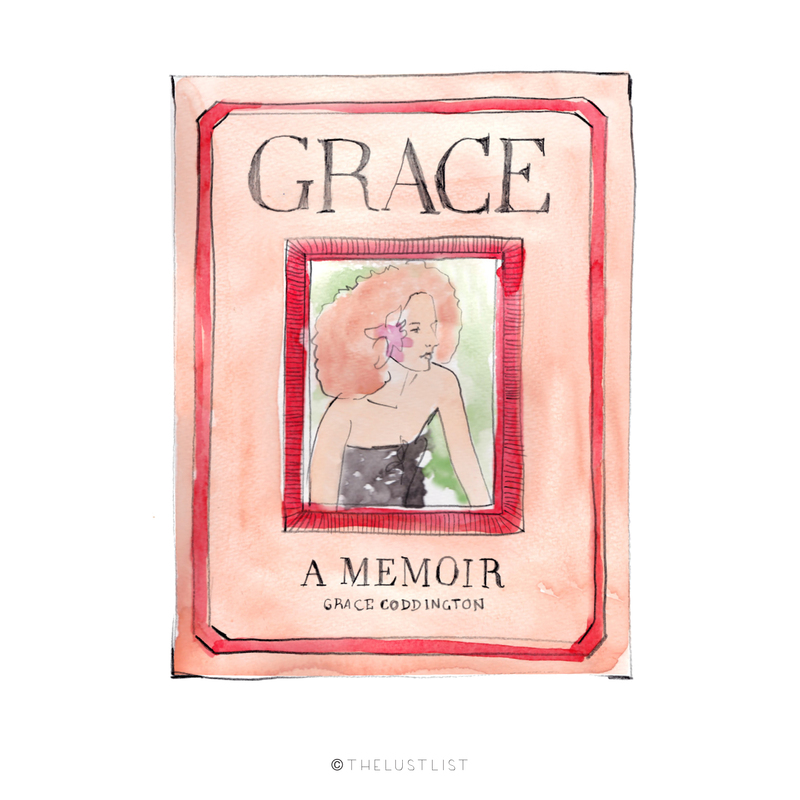 I want that Grace C. book so bad! Amazing drawings, such a talent! the illustrations are simply beautiful ! I just got my towel Hammamas for my next holiday. i like the fact it's versatile, not only a towel for sunbathing, but also for home, or picnics, for anything. i'll use it the whole year, it'll remind me the summer i guess. and of course, the techniques of producing guarantee the best quality. on holiday, I've always an "Eau Divine" bottle by Caudalie, i love the fragrance so much, it's incredible, i've tried a lot of body oils, but this one... my god...the best one in my opinion.